Scuba diving Gold Coast waterways for the past 20 years, with more than 50,000 dives. Queensland Scuba Diving operate a fleet vessels and caters for divers of all ages and skill levels. They offer scuba diving and snorkelling for the complete novice through to PADI certification at Instructor level. Their floating Gold Coast dive centre has a comprehensive range of scuba diving equipment and their experienced staff can help you choose what's right for you. Enjoy… the weightless experience of exploring the underwater world on the Gold Coast, Australia. A unique opportunity to relax your state of mind, whilst effortlessly improving your health and fitness. Add adventure to every travel destination through the exciting world of scuba diving. This dive is purely for pleasure and no experience is necessary. You will be accompanied by a certified PADI instructor throughout the whole dive. Besides seeing beautiful and fascinating aquatic creatures first hand, you’ll experience sensations unique to scuba diving, like the thrill of breathing underwater for the first time, and the feeling of floating weightless like an astronaut in space. You will be swimming amongst the Gold Coasts many species of fish having the opportunity to hand feed them. For those who wish to stay on top of the water, the Gold Coast's Wave Break Island is a fantastic site for snorkelling. This site is ideal for both the beginner and the advanced as there are over 50 different species of fish with depths ranging from 0 to 15 metres. Many of the fish school in their hundreds and are very people friendly, this provides excellent opportunities for underwater photography and fish feeding. Due to the location there is minimum swell and you are secluded from other boating activities, as well as a beautiful beach to relax on in between exploring what Wave Break has to offer. At Queensland Scuba Diving Company, they are qualified to take you right through from beginning with PADI Scuba Diver certificate through to PADI instructor. They also offer a large number of specialist courses all of which are PADI approved. PADI Scuba Diver - two days. 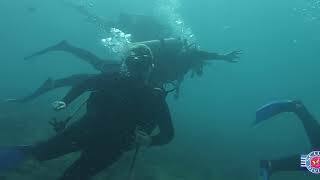 PADI Open Water Diver - three days. PADI Advanced Open Water Diver - two days. PADI Rescue Diver Course - two to three days. PADI DiveMaster Course - 10 days*. All courses commence on board their Floating Dive Shop.